Hints & Tips To get Started In Ordering Company Uniform. 21 Jul How Is Uniform Important To Your Company/Business? How Is Uniform Important To Your Company/Business? Uniform is everywhere and always has been everywhere. Since time began humans have been symbolising their tribe, army, family, heritage and much more with uniform. Designing and creating your uniform for your company or business should be a major priority from the start. It will be one of the most important decisions you can make when it comes to representing your business. No one will get it perfect first time. But as your company progresses and changes so will your ideas and how you want to portray your company to the world. That said, giving it some thought and time you can start to create something truly unique. So think carefully on how you would like you represent your self, your company and most importantly, Your Team. We recommend you aim to create a uniform for your company that will slowly be recognised and trusted in your local area. 1 – Use your companies logo as a starting point. Whether our Design Team here at Empire designs your logo or you have already done it your self, you can use this to help decide the colour scheme for your garments. Use Print or Embroidery to decorate your garments with your companies logo. 2 – What does your company do? In some cases there are limited options regarding Uniform (Mainly Hi-Vis). But determining the type of business you are will help in choosing the correct garments for your business. For example – Polo Shirts in the Office, T-Shirts for the Bar Staff, Hoodies for the Landscapers and Hi-Vis for the Builders. What ever you decide you can really personalise these garments to work with your companies brand. There are 1000’s of garments out there ready for personalisation that suit every budget. Our sales team can help with this and can recommend our best sellers in your companies colours/budget/uniform turnover. A business where your uniform needs to be thrown away needs to be taken into consideration. It all depends on the type of business you are in. We find this most with trades such as Cleaning Services, Car Valeting, Builders & Scaffolders. 5 – Print or Embroidery? Both have their pros and cons. 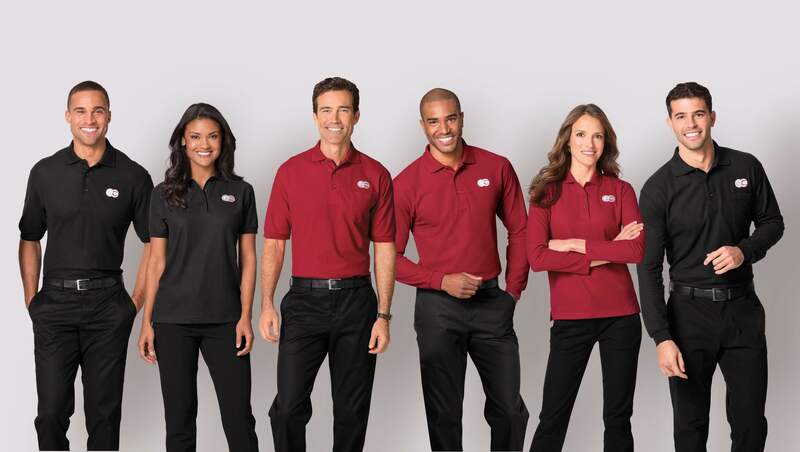 Embroidery is long lasting, looks professional on corporate uniform but does cost more. Print is cheaper and really works well for Hi-Vis and also throw away uniforms for this reason. Your team represents your company. 1 – Creates a brand that people remember. Firstly, you want them to remember you. Wether it is the company wearing the Pink Hi-Vis that are building the houses down the road or that Motorsport team with the Gold Embroidery on their Jackets. If it stays in their minds then that is mission complete. A well dressed employee? An insight into the product/service and as a result probably more likely to pick up that phone. Happy staff is always a good thing. Making them feel a part of the team goes a long way for staff moral. Easy to remember and therefore triggers a customers memory to contact your company for that service or product. Trust is important and being proud of how you look and the fact you are putting an identity to your service or product says a lot. 6 – And finally, a Walking Advertisement. Having your staff walking around in your company uniform advertises your business every single day where ever they are. We hope this advice helps you with ordering your Uniform but there is so much to think about and we understand that. Our sales team will guide you through the whole process including suggestions, samples, design work and Budget. Honestly they have been great. I knew nothing and I mean nothing about printing T-shirts and they walked me through the whole process and made me feel comfortable. One member of the team called Chloe in particular has been helping me. If you are working with this company, ask for her! She will get the job done. I needed a particular style of T-shirt and company after company continued to say no. Not these guys. The T-shirt is also great quality and a great price. So in other words, I feasibly cannot see how one can find a better competitor. I really cannot recommend them enough. I hope they continue to grow and improve. They deserve it. Period.